You are currently browsing the tag archive for the ‘CJ Bowerbird’ tag. There’s been a bit of activity in the world of the Blemish novellas, and, as always, I want to share it with you. First up, last weekend I read from I’m Ready Now (Blemish Books, 2012) at Bloom, an annual ‘open door’ festival held at the Gorman House and Ainslie arts centres in Canberra. It was a packed day with a whole heap of people checking out the enourmous range of activity that happens in these places, much of it normally behind closed doors. However, perhaps the most exciting part of the day for me was getting to share a literary bill with a bunch of writers who are extraordinary in their ability to perform their work, including Irma Gold, Sarah Rice, and slam poets Omar Musa and CJ Bowerbird. I hadn’t seen slam poets so up close and personal, and I was blown away; in fact I really was overwhelmed. If you ever get to see these guys perform, steal your grandmother’s purse to make it happen – the way they deliver, with such connection and understanding of how words spread out and fill all corners and crevices of a room, is something very special. Island: a place where some novellas happened; it’s also a journal in which I have a yarn with Andrew Croome. And then came this week, with the publication of the spring edition of Island, a longstanding literary journal out of Tasmania. 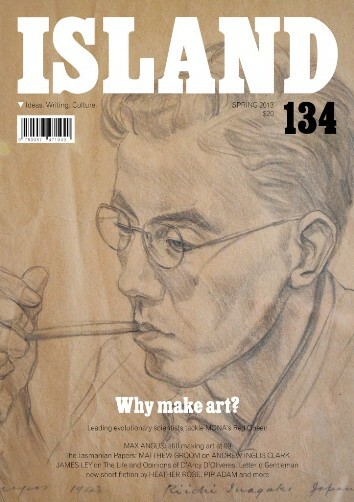 I always look forward to reading Island, but this one’s personally just a little more special as there’s an extensive interview with me, which was undertaken by Andrew Croome late 2012/early 2013. Andrew is an award-winning Canberra-based novelist of espionage thrillers, including Document Z (Allen & Unwin, 2009), for which he won the 2008 The Australian/Vogel Literary Award, and the highly acclaimed Midnight Empire (Allen & Unwin, 2012). In a nice case of turning the tables, I’d interviewed Andrew for the Canberra Times and Verity La. For the Island interview, we covered a fair bit of terrain, including the writing of Fall On Me (Blemish Books, 2011) and I’m Ready Now, the trials and tribulations of shifting between fiction and creative journalism, and the slipperiness of truth. I won’t spoil the interview – you can buy a hard-copy or e-version of the journal and gobble up all the goodness by clicking on the cover image glaring at you on your screen (!) – but Mr Croome’s first question, which, to be frank, almost stumped me straight up, was this: What compels you to write? Have your reasons been constant, or have they changed over time? Much gratitude to Andrew for getting me to think about these things, and to Island for giving our interview a home. UPDATE: Island has now made the interview available for free. It may be only for a short-time so get in quick, if quick is your thing, and literature is your thing also.